When I was growing up my Mom belonged to a benevolent women’s group called The Circle League. They encouraged education for women and gave out scholarships to needy students. They published a cookbook as a fundraiser and this is one of my favorite recipes from that book. It is a dark, rich date ‘n nut bread- perfect to slice and “smear” with cream cheese as we will do this weekend for a tea we are catering in Southbury,CT. I make the loaves in smaller pans so they are tea sandwich size- Enjoy! Top the dates with soda and butter. Bring water to a boil and pour over the date mixture and stir well until butter is completely dissolved. Add sugar to date mixture and blend. Add beaten eggs, salt and vanilla. 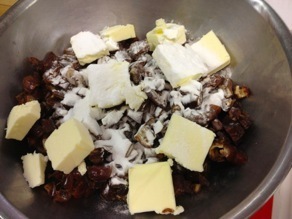 Add flour and walnuts and mix until blended. Pour into 2 well greased and floured loaf pans. Place baking pans on a cookie sheet and bake at 325°F for45-50 minutes. For a soft crust- If using smaller pans adjust the cooking time but bake at the same temperature. Let cool and remove from pans. Posted on March 14, 2012 by Loree Ogan.